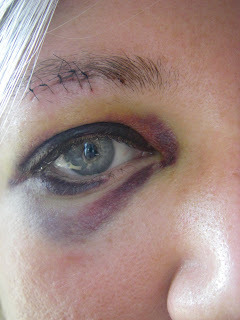 This was my eye last monday, three days after that mean old rock brutally attacked me. Notice how I have a nice little raccoon ring, but the swelling has gone down and the eye opens all the way! 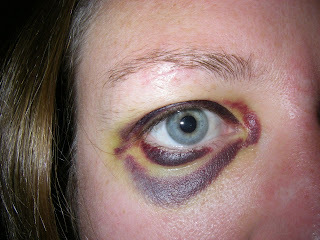 This is my eye a whole week later! It looks the same, except it has more yellow where it just used to be skin color. Also, you can tell I haven't plucked my eyebrows. Whatever. Noone is looking at the mess that is my face and focusing on my bushy eyebrow, they are too busy being horrified by the purple that is slowing moving down my cheek. I'm beginning to think I'm going to need to go out, buy some eggplant colored eye liner and go goth. 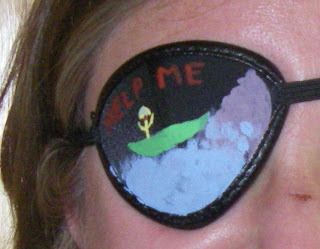 Luckily, I have a good friend who customized me an eye patch. I seriously looked for sequins but surprisingly enough, with a house full of 3 little girls I didn't have any or even and glitter, so paint had to do.